We have been in our present position in Beatty Road Archerfield for the past 43 years, a family run and owned business, and we take pride and care in the quality of the work we deliver. With now the 2nd generation body repairers as the current owners, we have a view to keeping up with the current trends and methodologies in this fast changing auto repair industry. During the time we have been in business we have provided an accident repair service to many Companies and Individuals in the Brisbane region. We are a family owned & operated business, and first opened our doors, at this location in 1973. At Sureline Body Repairs we repair all types of vehicles. With our outstanding reputation and over 42 years experience, you can be sure that your vehicle will look great and most of all be safe. We are committed to raising standards of service to our customers and to promote better more informed relations between insurers and their customers. Our workmanship is guaranteed. We provide free quotes for insurance claims. We not only have years of experience in the repair field, we align with the best group for Auto repair in Australia to ensure you of our commitment to quality service. Car Craft Accident Repair Centres an established and trusted organisation in the motor body repair industry in Australia. Read more on the Car Craft Group and the benefits this brings to you as a Sureline Body Repairs Customer. They understand the need to provide high quality repairs in the shortest possible time and will manage the whole process, including assistance with making your insurance claim if necessary, as well as repairing your vehicle. If you are not at fault in the accident Car Craft can assist with third party claims. All Car Craft members have been audited for compliance with the national Green Stamp Environmental Management System. Green Stamp is a motor industry specific program that provides accreditation for businesses that comply with all the requirements. Please call 07 3275 3134 or contact us for more information. Our restoration of a 1973 Holden Ute were met with fellow enthusiasts at Sureline. We found their passion to be contageous and the project ended up best in class at the show! Thank you Sureline for a job well done. After the massive hail storm Brisbane had, my partner and I picked Sureline to repair our car. I have seen there work on other cars done by Sureline for the company I work for and with in the time frame they had they did a really good job and keep me up to date on what was happening. 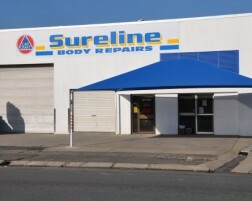 If you are looking for a Body Repair you cant go past Sureline.